Through June — before the stench of red tide’s fish kills permeated many areas and the algae’s aerosols became more irritating to human respiratory systems — Sarasota County’s “bed tax” revenue continued to climb toward a new record, according to the most recent report of the Sarasota County Tax Collector’s Office. Through June 30, the Tourist Development Tax (TDT) revenue was up $1,892,341.65, compared to the same period of the 2017 fiscal year, the Tax Collector’s Office data show. The revenue is derived from a 5% tax on accommodations. Reports provided to the Tax Collector’s Office, reflecting collections by motels, hotels, condominium owners and others, added up to $172,995.98 more than the figure for June 2017. In June of this year, the Tourist Development Tax (TDT) total was $1,855,726.75, compared to $1,682,730.77 in June 2017, the Tax Collector’s report says. With three months left in the fiscal year, the TDT revenue added up to $19,274,464.88. The revenue has broken records each fiscal year since 2013, when the tax rose to 5%, county staff pointed out to the county commissioners during their Aug. 22 budget workshop. 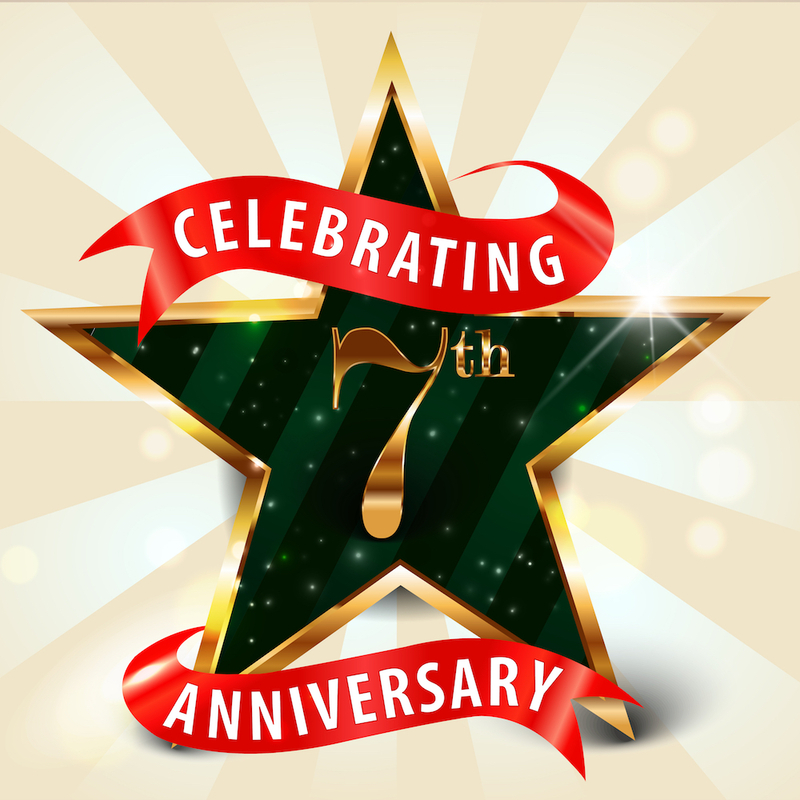 Last fiscal year, the total was $21,355,479.46; at the end of the 2016 fiscal year, the amount was $20,128,594.14, the Tax Collector’s Office records show. Additionally, from the beginning of the current fiscal year —Oct. 1, 2017 — through June, the total revenue submitted to the county by Airbnb hosts was $859,840.79, the Tax Collector’s Office notes. All the figures can change month-to-month, as the Tax Collector’s Office staff undertakes audits and other actions —including enforcement of the levy of the tax —, Tax Collector Barbara Ford-Coates has explained. For example, a deficit year-over-year for April has been wiped out in the latest report. Although it is the smallest increase for any month so far in this fiscal year, the figure in the June report shows that TDT revenue in April of this year was higher by $1,047.87 than the amount collected in April 2017. 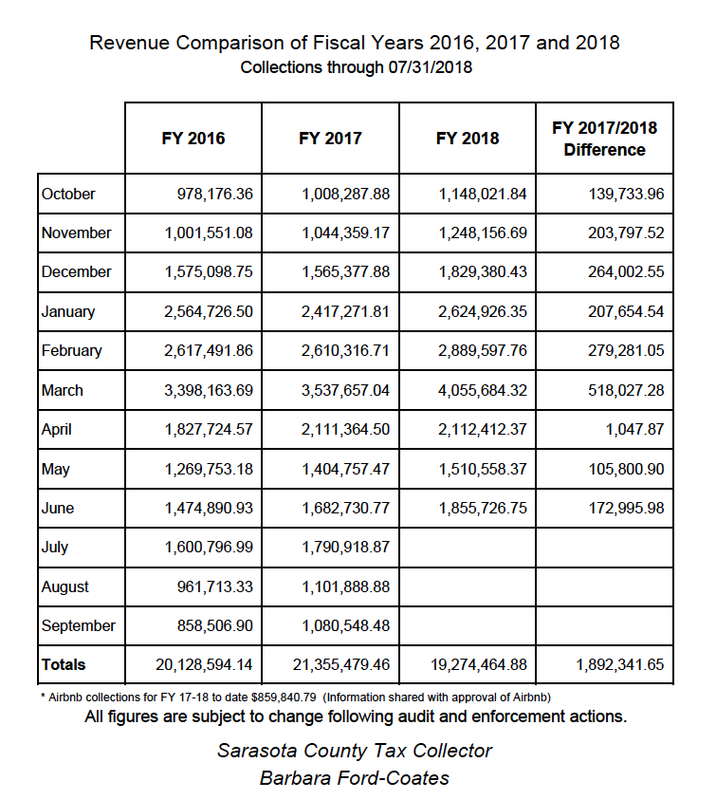 Additionally, the latest data show the total collections for March having climbed by more than $2,000, compared to the figure in the previous Tax Collector’s Office report. For June of this year, the total was $1,855,726.75; in June 2017, it was $1,682,730.77, the data show. 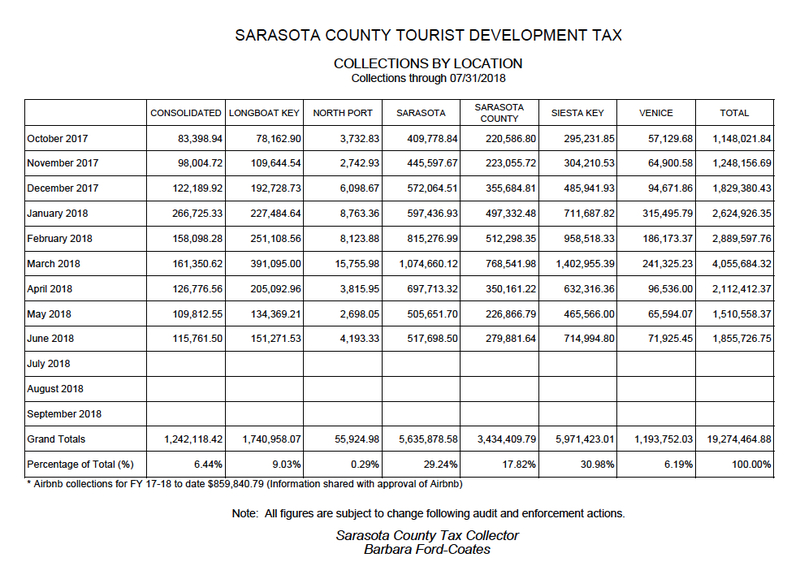 As for the locations across the county where the TDT is collected, Siesta Key entities remained in the lead through the end of June, with 30.98% of the total: $5,971,423.01. The city of Sarasota was in second place, with 29.24% of the revenue thus far: $5,635,878.58. 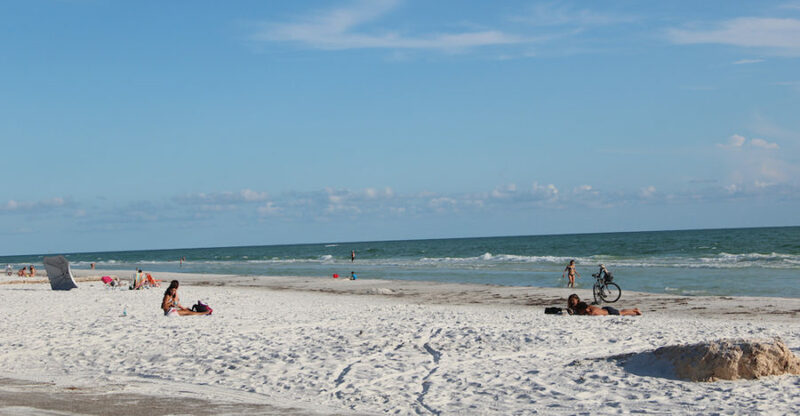 Visit Sarasota County — the county’s tourism office — also reported positive news for June.